Besides the Camera, another way to enhances your picture is how you edit your picture. There is a saying that “the best camera is your eyes”. While it is true that your eyes capture everything, but it is you, yourself that perceive the moment based on your perspective. Which is why, sometimes an editing photo is needed to speak out what you have seen. From one-touch filter apps to advanced creative editing, it is all tool to make your picture the best. 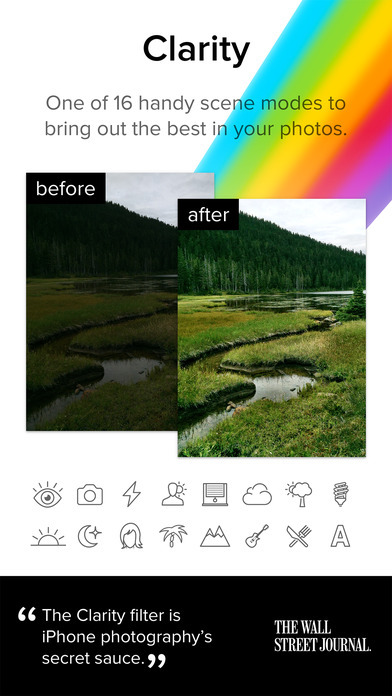 Here, you will discovered list of best photo editing apps on iPhone 6 and 6S to really enhances your picture. Check it out! Camera+ helps you use your iPhone to shoot the best photos you possibly can. it provides a wider range of exposure controls and advanced tools such as continuous flash, frontal flash, touch-focus adjustment, 6x digital zoom, a timer, and preset filters. The well-organized interface also makes it a breeze to utilize, whether snapping or sharing shots on social media. If you want to edit your photo to the perfect picture, then EyeEM is one of your choices. EyeEm features a quick and easy interface, allowing you to capture an image, quickly edit and resize it and then move on to composing the next shot. After edit, you can share it to your account that you can create in the apps. While sharing people will see and if they like your photo. They will buy the picture and you will get money for it. Mextures is the only app for applying film grain, textures, light leaks and beautiful gradients to your images in seconds. No other app is faster. And with our non-destructive workflow, you can can make changes to your photo at any time during your editing process. Fine tune your edits with photo adjustments and then save and share your edit for future use. Also included are over 200 beautiful formulas for easy, 1 click, editing created by some of the top iPhone photographers in the world. Mextures app offer a wide range of textures, grains and light leaks. Each of them is fully adjustable and you can combine as many as you want through an easy-to-use layering feature. The creative options available in Mextures really are endless, and it’s one of the best photo editing apps for creating your own unique editing style.